Love Never Dies… It Merely Changes Form. Blaming myself for the million things that I should’ve, would’ve, could’ve done seemed the easier solution. …and it’s not the entire truth (if it can be called truth at all). The truth is, I really, really, really loved Pebbles my Goldfish. I took my time cleaning off her tank, filter and other things today. The water may smell… but it’s the water Pebs swam in. A part of her is still in there… and draining it down the sink was like pouring the last remaining bit of her away. I kept taking breaks in between… to just stare at the tank, imagining the way she comes up to play, or looks at me, or dives at the food, or goes to sleep, or stay up late. Or I just sit there and cry. There was a moment, when the sight of yellow butterflies flying in and out of the forest caught my eye, even as tears streaming down my face was clouding my vision. I went up to the couch by the window to get a closer look. There were so many of them out today. All of them were yellow… the colour of sunshine. Earlier in the day, the song “you are the sunshine of my life,” was playing in my head as I was thinking of happy days with Pebs. So I kept staring at the yellow butterflies, wondering if perhaps, they were here to send me a message? The last time this happened, was pretty phenomenal. I was majorly depressed, and I had lost my reason to smile for a long time. I was looking up the sky as I was walking up the hill on the way home, angrily directing my thoughts Above. Suddenly, out of nowhere, a bunch of white butterflies rose up from the bush beside me and surrounded me like a hurricane. I stood rooted on the ground, struck by the awesomeness of what just happened… and then noticed that one of the butterfly, was a striking blue! A smile broke across my face at the wonder of it all, which was the time the butterflies flew away and disappeared, as if their mission had been accomplished. I knew that my question had just been answered. I am not alone in this world. He heard me. And He cares. And He is very real… I am assured. As I continued gazing at the butterflies outside the window, a reassuring voice of comfort, came to me from within. I tend to look at this line, a little more philosophically, of course. …and we have the power to change things. 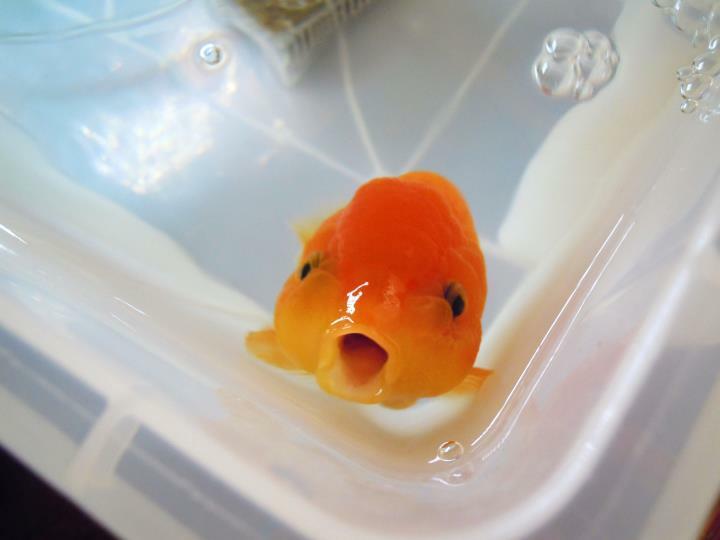 We ended up discovering three of the most amazing Ranchus, Patches, Peaches and Pebbles, a different breed of goldfish. They were as different from the earlier pair, as night is from day, and special in their own ways. In the end, our hearts were filled with so much love for them, because they were every bit as lovable as the earlier two. The idea all along, is not to be attached to the one… to how Love should appear to be, and to just let it flow, and go with the flow–just let Love be. My journey with Pebbles ends here, on 29th April 2012, the day she passed on unexpectedly. And then, as if knowing how lost I feel, the next scene in “Brother Bear” unfolds where NaNa, the grandmother is talking to her grandson Kenai. “Yes, LOVE,” NaNa repeated herself. “The bear of Love?” Kenai is very confused now, and very embarassed. Kenai shrugs her words off… and later ends up killing a bear. As a lesson, Kenai is “transformed” into a bear, to help him understand what it’s like to walk in the shoes of another. “You’re going to get a new perspective,” Nana said wisely, aware that her grandson has transformed into a bear. “…do you see the world in black and white, or in colours?” she asked, before disappearing and leaving the boy to go off on his own journey of self-discovery and growth, from a boy, to becoming the man that he is.